Before reproduction, the fish has to become sexually mature, just as with other animals. In a study done by Robert C. Summerfelt and Paul R. Turner, flathead catfish were found to age 10 years before becoming sexually mature enough to reproduce. Before a catfish can reproduce, the water in which it lives must reach a certain temperature range. Temperatures round 24 to 27 C (75 to 80 F) are ideal for the spawning of most types of catfish. If the water doesn't reach the proper temperature, the fish will not reproduce. Catfish spawn between March and June. This is when the water in their environment is an ideal temperature. 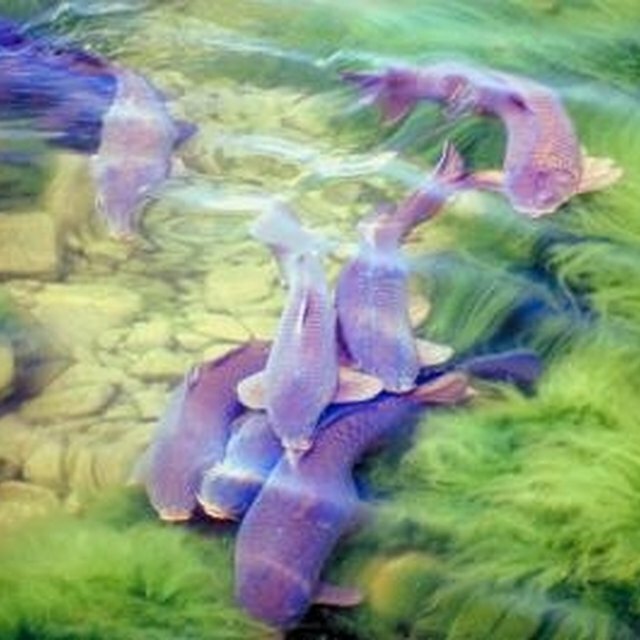 Spawning is the process of laying eggs. The male and female catfish build a nest in submerged timber, weeds or rocks. This area is usually secluded and easily guarded from predators. The female lays her eggs on the nest, which is a flat surface covered in bubbles produced by the parents. She can lay from a few hundred eggs to about 21,000. The older the fish and how large she is determines how many eggs she will lay. The male then sprays them with sperm to fertilize them. Some catfish, such as the white and channel varieties, guard their eggs until they hatch. It takes about 10 days for catfish eggs to mature and hatch. Once hatched, the babies (called fry) are protected by the male until they are about a week old. After the week is over, the fry leave the nest. McKee, Alina. "How Does a Catfish Reproduce?" Sciencing, https://sciencing.com/a-catfish-reproduce-4829150.html. 13 March 2018.